You are here: Home / Sponsors / How Can Conference Calls Save Businesses Money and Increase Productivity? How Can Conference Calls Save Businesses Money and Increase Productivity? Businesses are always looking for ways to cut costs, while increasing productivity and proficiency. But, how can a business do this with conference calling? Conference calls offer a method of contact between individuals, much like a regular telephone call. 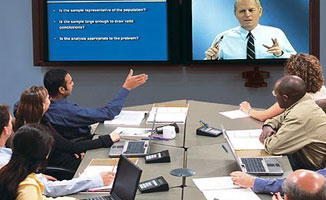 However, they can involve more participants in a single discussion; and a conference call can even include video streaming between the participants. They not only offer an effective method of communication, but a cost effective alternative to traveling. Since there are so many conference call providers who offer free services, your business can conduct virtual conferences and meetings with no investment. Free conferencing calling is a great way to contact clients cheaply, so there are no snags if the business has a low budget. You may require or desire more extensive features from your provider, which could cost a little extra. However, these costs are minimal compared to physical conferences or meetings. In a business, one of the biggest expenses is the employee workforce. Since you are spending a great deal of money on them, you want to ensure that they are some of the best employees your business could have. Regular conference calls can help you to monitor their productivity and value to your business, allowing you to effectively replace those who are not doing their jobs. When you can conduct meetings and conferences by phone or internet, there is no need for the participants to gather in an office environment for the meeting. If your business is renting an office or conference room to conduct meetings, this alternative can save you rental money. If your business currently has a conference room, you can transform that room into something that would be more beneficial for the business itself. Since you do not need to travel to these meeting points, you can save a little time and gas. Traveling can quickly rack up a large debt for a business. If your business is consistently paying for several employees to travel frequently for meetings and conferences, you can implement virtual conferences instead. Of course, you will still want to travel for larger, more important conferences; but for the less important ones, virtual communication should suffice. When employees travel, airfare is not going to be the only expense; there is also lodging, food, and transportation to consider while the conference participant is out of town. Traveling for conferences can take quite an amount of time; especially if the conference involves traveling across the country or internationally. Business deals can come and go quickly, and will sneak up on you when you least expect it. They may even require breaking commitments to other business tasks and responsibilities, which you may not be able to do. By using conference calling services, you can be a little more flexible for conferences regarding new business deals. Any new business deal can become a major opportunity for your business; and you do not want to miss out due to travel conflicts.